MicroRNAs (miRNAs), involving in various biological and metabolic processes, have been discovered and analyzed in quite a number of plants species, such as Arabidopsis, rice and other plants. However, there have been few reports about grapevine miRNAs in response to gibberelline (GA3). Solexa technology was used to sequence small RNA libraries constructed from grapevine berries treated with GA3 and the control. A total of 122 known and 90 novel grapevine miRNAs (Vvi-miRNAs) were identified. Totally, 137 ones were found to be clearly responsive to GA3, among which 58 were down-regulated, 51 were up-regulated, 21 could only be detected in the control, and seven were only detected in the treatment. Subsequently, we found that 28 of them were differentially regulated by GA3, with 12 conserved and 16 novel Vvi-miRNAs, based on the analysis of qRT-PCR essays. There existed some consistency in expression levels of GA3-responsive Vvi-miRNAs between high throughput sequencing and qRT-PCR essays. In addition, 117 target genes for 29 novel miRNAs were predicted. 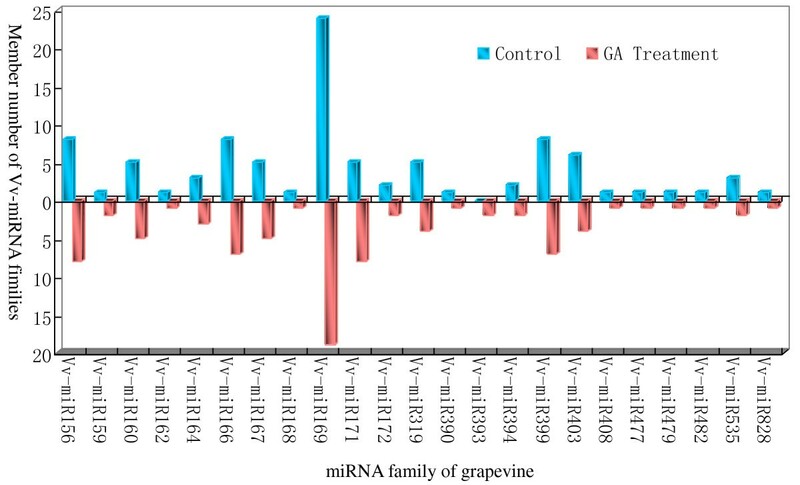 Deep sequencing of short RNAs from grapevine berries treated with GA3 and the control identified 137 GA3-responsive miRNAs, among which 28 exhibited different expression profiles of response to GA3 in the diverse developmental stages of grapevine berries. These identified Vvi-miRNAs might be involved in the grapevine berry development and response to environmental stresses. MicroRNAs (miRNAs) are endogenous gene regulators distributed widely in plant genomes, and they play important roles in plant growth, development, signal transduction and response to environmental stimuli [1–5]. Identification of miRNAs is a key step in gaining insight into sRNA-based regulatory functions with many conserved miRNAs having been identified by traditional sequencing approaches such as the Sanger sequencing method . However, most species-specific or tissue-specific miRNAs are hard to be detected probably because of their low accumulation and/or insufficient stringency of the sequencing approach [7–9]. The advent of new sequencing technologies could make it possible to mine even species-/tissue- specific miRNAs with low abundance, and they havebeen successfully used on Arabidopsis thaliana, Oryza sativa, Poplus tricocarpa, Medicago tuncatula, Gossypiumhirsutum, Zea mays, Arachis hypogaea L., Solanumlycopersicum, Citrus trifoliate, Vitis vinifera and Vitis amurensis Rupr. [10–21]. Grapevine (Vitis vinifera L.) is one of the most economically important fruit crops worldwide and has nutritional and processing properties . In recent years, sequencing of small RNA libraries from different grapevine cultivars or tissues has severally been reported where a large number of Vvi-miRNAs were identified [7, 18–21]. Despite this, there are no reports on the study of response of Vvi-miRNAs to phytohormones. Phytohormones are important endogenous signals and regulators involved in plant growth and development , and they are classified into auxins, gibberellins(GA3), cytokinins, abscisic acid(ABA) and ethylene. All of these phytohormones act at low concentrations to regulate different aspects of plant growth and development to varying degrees [23–25]. Among the hormones, GA3 play significant regulatoryroles in early berry expansion, berry set and berry ripening [26, 27]. Till now, it is still unclear on how GA3 participates in the regulation of the complicated developmental processes of grapevine berry. It has been reported that phytohormone signaling pathways can be effectively controlled by modulation of positive and negative regulators during plant growth and development . Among the modulators of phytohormones, miRNA was recently found to be a new growth regulator involved in phytohormone signaling [28–30], with several studies showing the interactions between miRNAs and phytohormones in various plant responses. For instance, GA3 modulates the expression of miR159, while miR159 regulates the development of Arabidopsi s anthers and seeds by cleaving the GAMYB gene, during Arabidopsis anther development  and seed germination . In strawberry, miR159 interacts with GAMYB during the course of receptacle development, and both of them act in a joint fashion to respond, in part, to changes in endogenous GA3 levels . These studies strongly demonstrated that miRNAs are involved in the GA3 signaling process. To account for the roles of miRNAs in response to GA3 during grapevine berry development, we constructed two small RNA libraries from mixed tissue samples of grapevine berries sprayed with GA3 (treatment) and with water (the control). The grapevine cultivar used for this study is ‘Summer Black’ (hybrid of V. vinifera?×?V. labrusca), an elite table grapevine cultivar native to Japan. After high-throughput sequencing, we identified a number of conserved and non-conserved Vvi-miRNAs responsive to GA3, and we further analyzed their potential role in mediation of GA3-induced regulation of grapevine berry growth and development. Further, qRT-PCR was utilized to analyze the expression of Vvi-miRNAs in different development stages of the grapevine berries subjected to exogenous GA3 and in exogenous GA3-free berries. Lastly, an attempt to elucidate the regulatory functions of Vvi-miRNAs being responsive to GA3 during grapevine berry development was done. To identify GA3-responsive miRNAs in grapevine berries, two small RNA libraries from grapevine berries treated with GA3 (GA3 treatment) and sprayed with water (the control) were constructed. Solexa, a high throughput sequencing technology, was employed to sequence these libraries, leading to a generation of 16,231,320 and 16,486,660 clean reads from GA3 treatment and the control libraries, respectively. All these clean reads were those from removal of adaptor, insert, polyA, and RNAs shorter than 18nt in length (Table 1). About 4,265,160 (GA3 treatment) and 4,326,915 (the control) clear reads could be mapped to the grapevine genome published in 2007 , and miRNA, tRNA, siRNA, snRNA, snoRNA, rRNA, repeat regions, exon and intron RNA reads were annotated. In addition, 9,075,238 and 9,207,588 un-annotated reads were used for prediction of new Vvi-miRNAs in GA3 treatment and the control grapevine berries, respectively (Table 1). 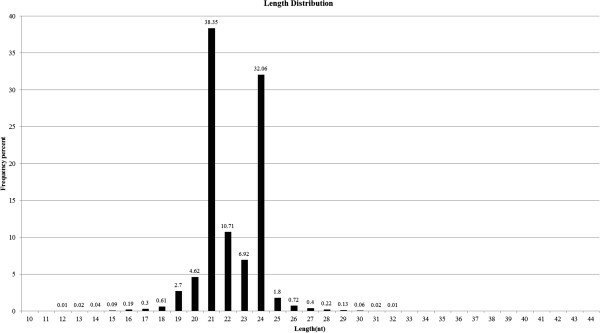 The size distribution of all sRNAs was found to be uneven ranging from 18nt to 30nt long, with the majority being 19-25nt long (Figure 1). The sRNAs of 21 nt and 24nt formed two major classes, occupying 38.35% and 32.06% (Figure 1) of the total, respectively, an observation which is in agreement with some previous reports in grapevine and tomato [11, 16, 21, 31], but contrasts to those reported in Arabidopsis, rice and peanut [32–35]. The two main peaks of sRNAs in this study were 24 and 21nt long, while the most common sRNAs in Taxus chinensis and Citrus trifoliate were those with 21 nt in length. These cases suggested that some differences might exist in the sRNA biogenesis pathways in various plants. In addition, analysis of the first nucleotide of 18-25nt long sRNAs indicated that many sRNAs started with a uridine (U) at their 5’-ends and most of them are 21 nt and 22 nt long, with the former being most outstanding in number (Figure 2). Similar to other plants, most miRNAs here were those with 21 and 22 nt in length and they also begin with a 5’uridine, which is one of the important characteristic features of miRNAs [10, 11, 36]. Size distribution of unique small RNA sequences from grapevine. First nucleotide bias of 18-30nt sRNA tags. High throughput sequencing can verify a large number of known miRNAs together with the identification of novel specific miRNAs even with the low abundance in organisms. From two sRNA libraries in this study, we first searched for known Vvi-miRNAs by comparing our libraries with known miRNAs from other plant species in miRBase 19.0 (http://www.mirbase.org/). A total of 122 known Vvi-miRNAs were sequenced both in the control and GA3-treatment libraries, and they belonged to 27 conserved miRNA families according to a comparative genomics-based analysis in different plant species . Eighteen of the 27 Vvi-miRNA families contained many members (Table 2), with four families (Vvi-miR169, Vvi-miR156, Vvi-miR166, Vvi-miR171 and Vvi-miR399) possessing 19, 8, 7, 8, and 7 members, respectively. Another nine Vvi-miRNA families (Vvi-miR162, Vvi-miR168, Vvi-miR390, Vvi-miR397, Vvi-miR408, Vvi-miR477, Vvi-miR479, Vvi-miR482, and Vvi-miR828) had only one member each. Among the known Vvi-miRNAs, the Vvi-miR166 family had the most abundant reads accounting for 63.2% of all the conserved miRNA reads. In this family, the number of Vvi-miR166h reads was over 500,000 in the two libraries, followed by Vvi-miR156, Vvi-miR168, Vvi-miR167, Vvi-miR479, Vvi-miR482 families, whose redundancies were more than several ten thousands. However, other miRNA families like Vvi-miR393, Vvi-miR394, Vvi-miR398 and Vvi-miR399 had only a few or tens of reads. Interestingly, the number and abundance of members of different Vvi-miRNA families between control and GA3 libraries were significant divergence (Table 2; Figure 3), which in turn could reflect the discrepancy in their potential functions during the development of grapevine berries responsive to gibberellin. Notes: ↑,↓,▲ ,▼,● denote up-regulated, down-regulated, induced, repressed, un-affected, respectively. Number of members from Vv-miRNA families in control and GA 3 treated grapevine berries. Bioinformatics analysis of the sequencing data could identify novel Vvi-miRNAs based on the criteria of novel miRNA annotations developed by Meyers et al. (2008) . The genomic sequences with flanking un-announced sequences were extracted. Among these sequences, 90 candidate Vvi-miRNAs were firstly uncovered, and the hairpin structures of their precursors’ could be predicted (Additional file 1). The miRNA* sequences available is of vital evidence supporting the release of miRNA duplex from the predicted foldback structure . Among these 90 potential novel Vvi-miRNAs, 28 had their Vvi-miRNA* sequences were detected (Additional file 2), and the sequences of 45 novel potential Vvi-miRNAs started with a 5’ uridine, the important feature of miRNAs (Additional file 2). 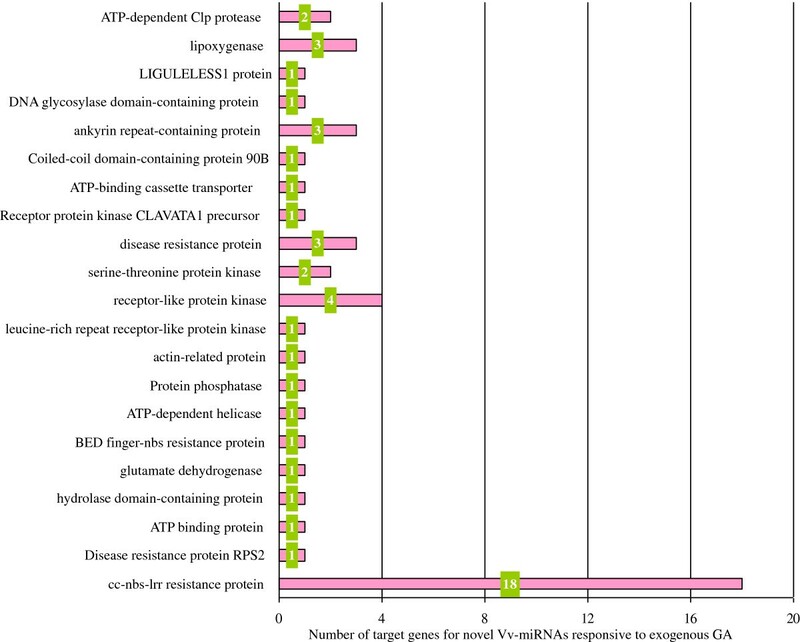 All these confirmed the existence of these novel candidate Vvi-miRNAs in grapevine. In this study, it was also noted that the novel Vvi-miRNAs had fewer reads than the conserved ones. 72% of the former had only several or dozens of copies except for Vvi-miRC20, Vvi-miRC36, Vvi-miRC43, Vvi-miRC44, Vvi-miRC45, Vvi-miRC46, Vvi-miRC50, Vvi-miRC51, Vvi-miRC52, Vvi-miRC71, and Vvi-miRC74 that were sequenced more than one thousand times (Additional file 2). This agreed with other previously reported results [10, 11, 36], where most novel species-specific miRNAs were usually expressed at lower levels than their conserved counterparts and were much more spatiotemporally expressed. To identify Vvi-miRNAs responsive to exogenous GA3, we normalized the counts of reads sequenced based on the systematical analysis, and compared the members and the normalized counts (NC) of different members of Vvi-miRNA families between the control and GA3 libraries. The results revealed that seven known Vvi-miRNAs (Vvi-miR159b, Vvi-miR160f, Vvi-miR171e, Vvi-miR171f, Vvi-miR171h, Vvi-miR393a and Vvi-miR393b) were found only in the GA3 treated grapevine tissues not in the control, suggesting they were probably those induced by GA3; another 21 known Vvi-miRNAs (Vvi-miR160d, Vvi-miR166c, Vvi-miR169a, Vvi-miR169e, Vvi-miR169j, Vvi-miR169m, Vvi-miR169s, Vvi-miR319b, Vvi-miR394a, Vvi-miR395a, Vvi-miR395b, Vvi-miR395c, Vvi-miR395d, Vvi-miR395e, Vvi-miR395h, Vvi-miR395i, Vvi-miR395j, Vvi-miR399b, Vvi-miR403a, Vvi-miR403b and Vvi-miR535a) were strongly repressed in GA3 treatment for they could only be detected in the control but not in the GA3 treatment (Table 2). Thirty novel Vvi-miRNAs (Vvi-miRC02, Vvi-miRC03, Vvi-miRC05, Vvi-miRC08, Vvi-miRC10, Vvi-miRC11, Vvi-miRC13, Vvi-miRC14, Vvi-miRC16, Vvi-miRC17, Vvi-miRC21-Vvi-miRC26, Vvi-miRC33, Vvi-miRC39, Vvi-miRC41, Vvi-miRC42, Vvi-miRC54, Vvi-miRC55, Vvi-miRC57, Vvi-miRC59, Vvi-miRC61, Vvi-miRC64, Vvi-miRC65, Vvi-miRC68 and Vvi-miRC72) were found to be responsive to exogenous GA3, for they could only be detected in GA3 treated grapevines (Table 2); while another 16 novel Vvi-miRNAs (from Vvi-miRC75 to Vvi-miRC90) were repressed by exogenous GA3, and found only in control but not in GA3 treatment (Table 2). These results demonstrate that these groups of Vvi-miRNAs could be responsive to GA3 treatment. 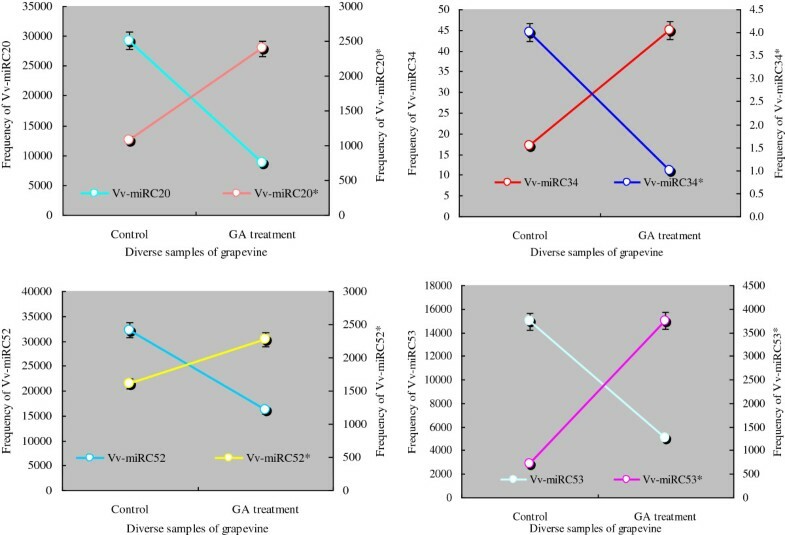 Further comparison of the normalized counts of Vvi-miRNAs identified in GA3 treated and the control plants indicated that many Vvi-miRNAs exhibited drastic variations (increases/decreases over several times) in expression frequencies. As shown in Table 2 and Table 3, the expression of 137 Vvi-miRNAs was strongly responsive to exogenous GA3, with 58 of them induced by GA3, showing conspicuously up-regulated expression under GA3 treatment (pointed as ↑ in Table 2 and 3).Conversely, 51 Vvi-miRNAs were repressed by exogenous GA3 (pointed as ↓ in Table 2 and 3), leading to drastic reduction in their expression levels in GA3-treated grapevines. An interesting revelation was that diverse members of the same Vvi-miRNA family could exhibit conspicuous discrepancy in their responses to exogenous GA3. This aspect is best exemplified by Vvi-miR166 family, where Vvi-miR166d/e/f/g had more than 246,000 reads in control samples, but possessed only several dozen or even a little more reads in the GA3 treatment samples, while Vvi-miR166b was detected 37,952 times in control and 176,156 times in GA3 treatment (Table 2). Vvi-miR166h, however, had no distinct variations between the control and GA3 treatment (Table 2). 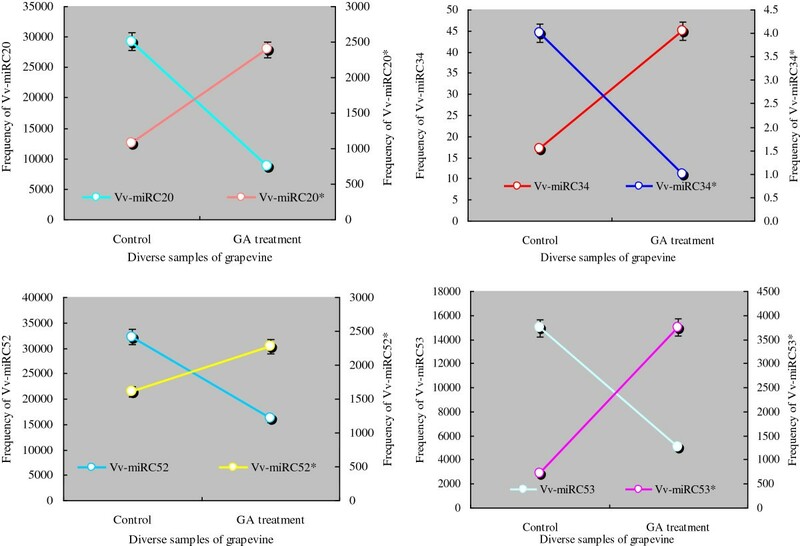 Similar situations were found in other Vvi-miRNA families like Vvi-miR156, Vvi-miR164, Vvi-miR167, Vvi-miR403 and Vvi-miR535 (Table 2), suggesting the Vvi-miRNAs responsive to exogenous GA3 application possess multiple aspects and functions during the development of grapevine berries. Notes: ↑,↓,▲ ,▼,● denote up-regulated, down-regulated, induced, repressed, un-affected, respectively; the symbol * denotes the complementary strands of miRNAs. Spatiotemporal expression of grapevine miRNAs could not only provide clues to their physiological functions, but also give fundamental evidence supporting the existence of the miRNAs in grapevine. In this study, 53 Vvi-miRNAs (27 conserved Vvi-miRNAs and 26 novel candidate Vvi-miRNAs) detected in grapevine berries treated with GA3 were subjected to qRT-PCR expression analysis as described in Section 2. This could also be applied to the analysis of the degree of response of these Vvi-miRNAs to GA3 treatments. We screened for the expression profiles of miRNAs responsive to GA3 treatments in the diverse stages of grapevine berries by qRT-PCR. The results showed that the expression levels of 15 Vvi-miRNAs (Vvi-miR169d, Vvi-miR319c, Vvi-miR393a, Vvi-miR396a, Vvi-miR398a, Vvi-miR399a, Vvi-miRC03, Vvi-miRC04, Vvi-miRC05, Vvi-miRC08, Vvi-miRC10, Vvi-miRC13, Vvi-miRC19, Vvi-miRC26 and Vvi-miRC37) were up-regulated by GA3, while 13 (Vvi-miR167a, Vvi-miR171d, Vvi-miR395f, Vvi-miR397a, Vvi-miR408, Vvi-miR482, Vvi-miRC06, Vvi-miRC14, Vvi-miRC15, Vvi-miRC24, Vvi-miRC27, Vvi-miRC30, Vvi-miRC38) were down-regulated by GA3, and seven (Vvi-miR156d, Vvi-miR166h, Vvi-miR390, Vvi-miR477, Vvi-miRC23, Vvi-miRC29, and Vvi-miRC36) were un-affected by GA3 (see Figure 4). Expression patterns of miRNAs in grapevine berries underdifferent GA 3 treatments and control. Further analysis of the expression results of 16 known Vvi-miRNAs responsive to GA3 both from qRT-PCR and high throughput sequencing revealed that the qRT-PCR expressions of 11 were consistent with the results from high throughput sequencing, which could not only demonstrated the reliability of these two technologies, but confirm the characteristics of these known GA3 responsive Vvi-miRNAs. On the other hand, it was discernible that the expression analysis results of 18 novel GA3 responsive Vvi-miRNAs from both qRT-PCR and high throughput sequencing were not of the same phenomenon, for only three (Vvi-miRC19, Vvi-miRC14 and Vvi-miRC29) was in the same way. This discrepancy in behavior of conserved and novel Vvi-miRNAs requires further research; while the consistency of the expression results, for the most conserved and a few novel Vvi-miRNAs, from the assays of the qRT-PCR and high throughput may provide some evidence supporting the fact about these Vvi-miRNAs responsive to GA3. To further comprehend the functions of these newly identified species-specific Vvi-miRNAs, it was essential to search for their target genes. Following the rules suggested by Schwab et al. (2005) , we searched the grapevine transcript database (http://www.genoscope.cns.fr/spip), and predicted a total of 117 putative target genes for 29 novel Vvi-miRNAs (Additional file 3). Among the 29 novel Vvi-miRNAs, 11 had multiple target genes, as exemplified by Vvi-miRC03 with 19 target genes, indicating these Vvi-miRNAs might possess comprehensive functions in grapevine. Based on orthologous functional annotation in other plants, these target genes seemed to be functionally involved in glucose metabolism (DNA glycosylase domain-containing protein), aromatic substance biosynthesis in berry (lipoxygenase, nigralipoxygenase), signal transduction (receptor-like protein kinase, serine-threonine protein kinase, protein phosphatase), stress resistance (ankyrin repeat-containing protein, disease resistance protein,cc-nbs-lrrresistance protein, domain-containing disease resistance protein, leucine-rich repeat receptor-like protein kinase), etc. (Figure 5; Additional file 3). We also noted that there were a large number of potential target genes with unknown functions for novel Vvi-miRNAs, especially those responsive to GA3 (Additional file 3). More in depth investigation on their functions would be essential for thorough understanding of the mechanisms of grapevine flower and fruit development and of the formation of berry quality. Functional classification of target genes for novel Vv-miRNAs responsive to exogenous GA 3 . To verify the nature of potential miRNA targets and to study the Vvi-miRNAs’ regulation on their target genes, a modified RLM-RACE experiment was set up and used to map the cleavage sites in four predicted Vvi-miRNA target genes. 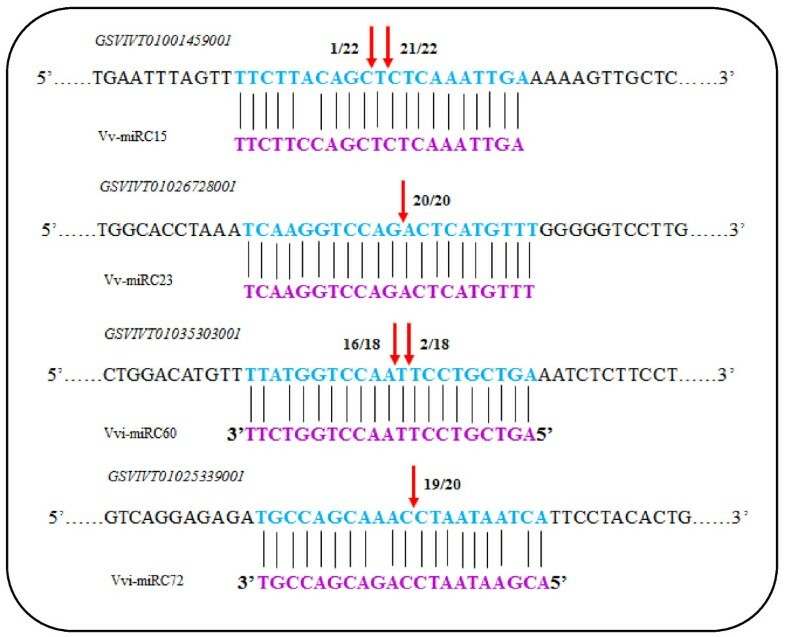 Results showed that the cleavage sites of these four miRNA target genes GSVIVT01000639001, GSVIVT01026728001, GSVIVT01037667001 and GSVIVT01037667001 for Vvi-miRC15, Vvi-miRC23, Vvi-miRC60 and Vvi-miRC72 in this study is at the nucleotide that pairs with the 9th and/or 10th and/or 11th nucleotide of the corresponding miRNAs (Figure 6), consistent with previous related reports [7, 16, 18, 19, 40]. The GSVIVT01000639001, GSVIVT01026728001, GSVIVT01037667001 and GSVIVT01037667001 were confirmed as the true targets of Vvi-miR015, Vvi-miR023, Vvi-miR060 andVvi-miR072, respectively. Functional analysis indicated that GSVIVT01000639001, GSVIVT01026728001, GSVIVT01037667001 and GSVIVT01037667001 could be of cc-nbs-lrr resistance protein, nbs-lrrresistance protein, leucine-rich repeat family protein, and lipoxygenase (Additional file 3). Verification of target genes for Vvi-miRNAs by RLM-5’-RACE. To verify the hypothesis that miRNAs play some role inregulating plant response to GA3, two small RNA libraries from grapevine berries treated with GA3 and without GA3 were constructed and used for high-throughput sequencing of sRNAs, from which a total of 212 Vvi-miRNAs (both known and novel), with 137 of them being firstly found to be responsive to GA3 in grapevine. Further comparison of our dataset from this work to Vvi-miRNAs reported earlier by us  revealed that since the grapevine materials used in these studies was the same grapevine cultivar, most of the Vvi-miRNAs could be observed in these two studies, while only a few members (such as Vvi-miR171f, Vvi-miR171h) could be discovered in one of both studies, which may be derived from the differences in the development stages of grapevine materials used in these studies or GA3 induced/depressed Vvi-miRNAs in this work. The breakthroughs in sequencing technology have provided the most powerful tool for miRNA discovery, and one of the advantages of the thorough approach is its ability to reveal novel miRNAs. In this work, a large number of novel candidate Vvi-miRNAs were uncovered, with the miRNAs* for some novel Vvi-miRNAs being detected too. The identification of miRNAs*of the candidate miRNAs provides convincing evidence for consideration of these Vvi-miRNAs as authentic . Importantly, the expression levels of some novel Vvi-miRNAs and their miRNAs* under GA3 treatments had much more diverse variation compared to the control. The best examples of this phenomenon are Vvi-miRC20/Vvi-miRC20*, Vvi-miRC34/Vvi-miRC34*, Vvi-miRC52/Vvi-miR C52* and Vvi-miRC53/Vvi-miRC53* (Figure 7). The expressions of Vvi-miRC20 and Vvi-miRC34 were up-regulated in GA3 treatments compared to the control, while the expression of their miRNAs* was down-regulated. On the contrary, the expressions of Vvi-miRC52 and Vvi-miRC53 were down-regulated in GA3 treatments, while those of their miRNAs* were up-regulated (Figure 7). The reasons for these discrepancies have not been clearly elucidated. The drastic variation in expression levels of the Vvi-miRNA* under GA3 treatments could indicate these miRNAs* were important regulatory genes like Vvi-miRNAs . Comparison of expression modes for Vv-miRNAs and Vv-miRNAs*. From high throughput sequencing and qRT-PCR analysis, it was further revealed that the conserve Vvi-miRNAs responsive to GA3 had the higher consistency between these two assays, while the novel ones showed some distinct discrepancy. This might be derived from the fact that the conserved Vvi-miRNAs possessed the higher conservation of development and function, while the novel ones had high specificity. Other, the samples used in the high throughput sequencing were the mixed materials from grapevine berries of several development stages, while those used for the qRT-PCR were of three stages berries (1 week after flowering (WAF), 5 WAF, 9 WAF). These could be the reasons explaining the expression levels of novel Vvi-miRNAs from qRT-PCR and high throughput sequencing had more apparent differences than those of conserved Vvi-miRNAs. In addition, the predication of potential target genes for novel Vvi-miRNAs responsive to exogenous GA3 and functional annotations of their orthologous target genes in other plants revealed that 20 genes were related to stress resistance. Whether or how these GA3 responsive novel Vvi-miRNAs are involved in the regulation of stress resistance can call for further research. The functions of one-third of the novel Vvi-miRNAs were unknown, indicating that more studies need to be performed on these novel miRNAs to elucidate their functions in the growth of grapevine. Deep sequencing of short RNAs from grapevine berries in GA3 treatment and the control identified 137 GA3-responsive miRNAs, of which 28 exhibited different expression profiles of response to GA3 in the diverse developmental stages of grapevine berries. These Vvi-miRNAs identified might be involved in the grapevine berry development and response to various environments. Mixed samples of young berries (one week after flowering, WAF1) large berries (five week after flowering, WAF5), and old berries(nine week after flowering, WAF9) treated with 50 mg/lGA3, were collected in 2011 from four-year old ‘Summer Black’ grapevine (hybrids of V. vinifera and V. labrusca) trees grown under common field conditions at the Nanjing Agricultural University fruit farm, Nanjing, China. Each type of samples had three replicates during deep sequencing and qRT-PCR. All the samples were immediately frozen in liquid nitrogen and stored at −80°C until use. Mixed Summer Black’ grapevine young berries (one week after flowering), large berries (five week after flowering after flowering), and old berries (nine week after flowering) treated with GA3, wereusedforRNAextraction. The total RNA samples were first extracted usingour modified CTAB method . Isolation of small RNAs and preparation of small RNA libraries were performed based on the procedure of Wang et al. (2011) . sRNAs were first separated from the total RNA by size fractionation with 15% TBE urea polyacrylamide gel (TBU) and small RNA regions correspondingto the 18–30 nucleotide bands in the marker lane were excised and recovered. The 18–30 nt small RNAs were 5’ and 3’ RNA adapter-ligated by T4 RNA ligase and at each step, length validated and purified by TBU electrophoretic separation. The adapter-ligated smallRNA was subsequently transcribed into cDNA by SuperScript II Reverse Transcriptase (Invitrogen) and PCR amplified using primers that annealed to the ends of the adapters. The amplified cDNA constructs were purified and recovered. 18 ng cDNA was loaded into the Illumina 1 G Genome Analyzer for sequencing. To identify conserved and potential Vvi-miRNAs in grapevine, the raw sequences were processed as described by Sunkaret al. (2005) . All sRNAs sequences from 18nt to 30nt obtained were removed from the vector sequences, then the modified sequences were further subjected to removal of rRNA, tRNA, snRNA, snoRNA and those containing the polyA tails, and finally the remaining sequences were compared against known plant Vvi-miRNAs in the miRBase . Only the high matching (0-3mismatches) sequences were considered as conserved Vvi-miRNAs. To study potential Vvi-miRNAs precursor sequences, all sRNAs from grapevine were aligned against the grapevine genome and then the miRNA candidates were processed by miRCat (http://srna-tools.cmp.uea.ac.uk/) , using default parameters, to generate the secondary structures (Additional file 1). The template for RT-PCR was the miRNA-enriched library mentioned above. To amplify the Vvi-miRNAs from the reverse transcribed cDNAs, we used the Vvi-miRNA precise sequences as the forward primers and the mirRacer 3’Primer as the reverse primer  (Additional file 3). RT-PCR was conducted with the Rotor-Gene 3000 (Corbett Robotics, Australia) and the Rotor-Gene software version 6.1. For each reaction, 1 μL of diluted cDNA (equivalent to about 100 pg of total RNA) was mixed with 10 μL of 2X SYBR green reaction mix (SYBR® Green qRT-PCR Master Mix; Toyobo, Osaka, Japan), and 5 pmol each of the forward and the reverse primers were added in a final volume of 20 μL. The conditions for the PCR amplification were as follows: polymerase activation at 95°C for 1 min, then 95°C for 1 min, followed by 50 cycles of 95°C for 15 s, 95°C for 15 s, 60°C for 20 s, and 72°C for 20 s. The comparative quantification procedure was used to determine relative expression levels, and the homologous genes of the Arabidopsis 5.8S rRNA in grapevine berries was previously used as a reference gene in the qPCR detection of miRNAs in Arabidopsis. The data were analyzed with an R2 above 0.998 using the LinRegPCR program . Target predictions were performed based on methods described by Schwab et al.(2005) . Putative Vvi-miRNAs were first blasted against the grapevine unigene database on the Genoscope (http://www.genoscope.cns.fr/). BLASTn hits possessing less than four mismatches were chosen as the candidate targets, and then BLASTx was used to obtain their putative functions. The sequences of predicted targets and their functions are shown in Additional file 4. The sRNA sequence data from this study have been submitted to Gene Expression Omnibus (GEO) under accession No. at website: http://www.ncbi.nlm.nih.gov/geo/query/acc.cgi?token=dlihnquimuscezm&acc=GSE3973. This research was supported by Project Funded by the Natural Science Foundation of China (NSFC) (No. 31301759), China Postdoctoral Science Foundation(2013 M531373), Postdoctoral Science Foundation of Jiangsu Province(1301116C), the Priority Academic Program Development of Jiangsu Higher Education Institutions (PAPD), the National Science Foundation of China (No. 60901053), and the Nanjing Agricultural University Youth Science and Technology Innovation Fund (KJ2013013). JH and CW carried out the molecular genetic studies, participated in the sequence alignment. YY and XS carried out the RT-PCR arrays. XL and CS participated in the sequence alignment. CW performed the statistical analysis. JH and CW drafted the manuscript. JF and CW conceived of the study, and participated in its design and coordination. JF revised the manuscript. All authors read and approved the final manuscript.